Is crisis of Taekwondo over? South Korea's national sport Taekwondo survived the threat of being ditched out as an official event in 2012 Summer Olympics to be held in London. In a vote, held at in Singapore July 8, 2005 as part of the IOC (International Olympic Committee)'s 117th Congress, Taekwondo gained more than half of the votes cast by 115 IOC members. Meanwhile, baseball and soft ball failed to continue to remain as an official Olympic event. Baseball has been an official game since it was adopted as such in 1992 Barcelona Olympics. In case of softball, it became an official Olympic game in 1996 Summer Games held in Atlanta, Georgia. Baseball's failure is mostly ascribable to the fact that American major leaders are not participating in the Olympic Games. Softball got poor scores from the IOC voters, since it lacks universality and international recognition. The IOC votes were conducted on the each of the Summer Olympics' 28 games. Details of the voting results were not announced. Taekwondo was adopted as an official Olympic game in the 2000 Sydney Summer Olympics. With the positive result from IOC's Singapore Congress Taekwondo will remain until 2012 London Olympics, but four years from now it will be subject to another IOC vote to be available for 2016 Olympics. 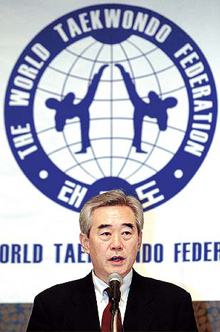 WTF (World Taekwondo Federation) President Chungwon Choue delivers a speech at his inaugural ceremony held at the Plaza Hotel in downtown Seoul June 25, 2004. Lovers of Taekwondo and South Koreans were worried that its national sport might be kicked out of the Olympic Games as there were some problems with Taekwondo. There had been some senses of crisis involving Taekwondo which was under attack from critics for its lack of fairness in judgement, low interest in the game, and being unsuitable for television broadcasting. The Korea's traditional martial art has also been challenged by karate, a Japanese martial art, ever since it became an official Olympic sport in 2000. The satisfactory outcome was made possible by the reform move by the world governing body of Taekwondo. In recent months World Taekwondo Federation has conducted a series of reform actions as part of its efforts to make it truly a sport loved by people around the world. Some of the reforms included introduction of an electronic scoring system and revision of match rules. Other sporting bodies including Korean Olympic Committee (KOC) were also helpful. Even President Roh Moo-Hyun stepped in. President Roh wrote to the International Olympic Committee (IOC) President Jacques Rogge, seeking Rogge's support in keeping Taekwondo as an Olympic event. In his letter, delivered July 4, 2005, by Korean Olympic Committee head Kim Jung-Kil, Roh called for Rogge's continuing support for the Korean sport Taekwondo.